Employing “write-once-run-anywhere” approach, we can take you farther, faster. We craft top-notch mobile experiences that engage users and meet your business requirements. 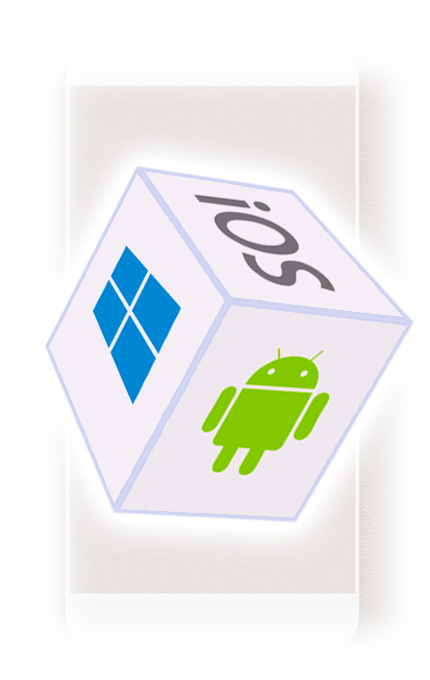 We design, develop and deliver native Android, iOS, and Windows mobile applications. Using the same IDE, language, and APIs everywhere we maintain same coding standard and streamlined app delivery. At the same time you get an app that ensures platform-specific functionality as well as native look and feel of the platform. Power, Flexibility and Scalability are built in on our apps. Hybrid mobile apps can harness the full power of web servers and server side scripting technologies. Coupled with the access mobile platform’s native SDK – it is truly the right way to develop a business or productivity app that can reside on cloud, be developed and deployed quickly and allow for rapid changes. Get your Hybrid mobile app developed with QuantumCloud. You are not done after developing your innovative idea into a functional mobile application. We can also help you with professional maintenance, support and optimization services. Ensure that your app is never off the race track and always leading. We help you create a branding personal along with logo, website, SEO to make sure that your app is a success. Publishing your App to an play store or itunes can be tricky. We take care of the process for you. Our full-cycle mobile application development services let you transform a mere idea into an elegant feature-rich top-rated mobile application. Custom developed mobile apps to add great value to your business strategy by expanding its reach. Optimize your legacy mobile application for better user experience and convert it into a next gen app for IOS or Android devices. Develop Android App or IOS App or Both – all under one budget and same code base. Go farther, faster. Build mobile apps with In App Functionality and/or ad revenue. The choice is yours to make. Boost your business by supporting existing mission-critical desktop or web software with new custom-tailored mobile apps. Hybrid app with web based admin area to manage app features, manage users and more. Software based and real human QA testing to improve the quality of your app. We ensure better user satisfaction and increase app engagement. We focus on maximizing your mobile app’s performance by fine-tuning loads, creating optimum backend environments, and fast User Interface. We pay special attention to mitigate potential security risks by following security best practices and industry best standards. Develop or Integrate custom communication adaptors and REST/SOAP services. SEO, Inbound marketing, branding and web development to give you a complete 360 degree range of services. Develop and Deploy the mobile application on the app store and play store as an enterprise application or as a downloadable application, depending on your requirements. We like to work both on “product driven” (an app that does something) and “campaign driven” (an app that sells something) mobile application development. We love to work on mobile apps that are innovating, functional, game changing, aesthetic and above all – useful for the people. For corporations and enterprises QuantumCloud combines the power of mobile technology with our business domain knowledge to simplify complex business processes by exploring the potential of mobilization to engage companies to collaborate with their consumers or employees. Outsource Mobile Application Development Projects to QC.